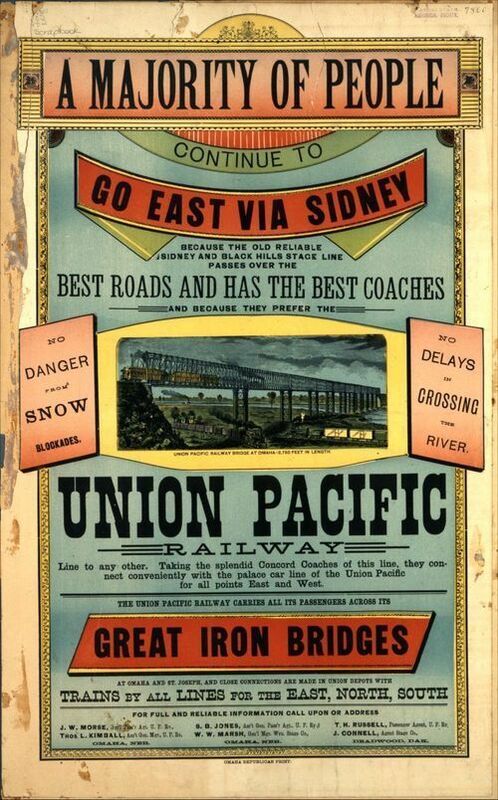 This Union Pacific Railway poster promotes travel east from Sidney, Nebraska, on the Union Pacific Railway. It claims the Sidney and Black Hills Stage line passes over the best roads and has the best Concord Coaches. The stage line connects with the palace cars of the Union Pacific Railway to travel to all points east or west, crossing rivers on great iron bridges. At Omaha, Nebraska, or St. Joseph, Missouri, connections could be made to all points east, north, or south.